Our neighborhood is slated for the largest upzone of Single Family properties in the City. Did you know the city is proposing to rezone our community to allow developers to replace Single Family homes with multi-story, multi-family buildings? We believe there is a smarter approach to increase density in the Crown Hill Urban Village (CHUV) that will meet the city’s growth goals and make our neighborhood a more livable community for all. 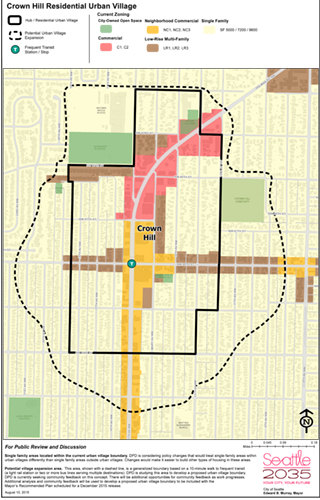 If you live between 22nd Ave NW and Dibble Ave NW, South of 95th St. and North of 76th St, your home is likely within the proposed expanded Crown Hill Urban Village and slated to be upzoned to multifamily within the next two years. The proposed upzoning is part of the City’s Housing Affordability and Livability Agenda (HALA) proposals to add density to our City. This zoning change will impact large areas of Loyal Heights, Whittier Heights, Greenwood, Olympic Manor and Crown Hill neighborhoods. If the current proposals are approved without changes, the City will rezone CHUV single family properties to multi-unit lowrise or other multifamily residential buildings. This means that developers can buy current single-family homes and replace them with with large, multi-story buildings. How can we Direct Growth to Benefit Everyone? Expedite CHUV Neighborhood Planning BEFORE rezoning. Re-develop the one-story commercial buildings and empty parking lots along arterials to multi-story, mixed-use residential and commercial buildings. Encourage commercial spaces that support small and locally owned business. Limit Single Family upzoning to protect our neighbors at risk of displacement and encourage smart development of arterials. Prioritize Infrastructure and Transit Upgrades before New Growth: Link added density to better infrastructure capacity. Add more reliable, frequent transit such as light rail, bus and bike options. Add sidewalks north of 85th for pedestrian safety. Overcrowded schools, parks and utilities need improvement to accommodate more growth. Download the Map of Impacted Homes and the flyer for more information.